So long newspaper life, but wait, there’s more! A few of my earliest Milwaukee Sentinel columns. Ignore that sketch of the young punk reviewer! The times, and location of car columns, is a changin’ …. There comes a time to say goodbye to parts of our lives. 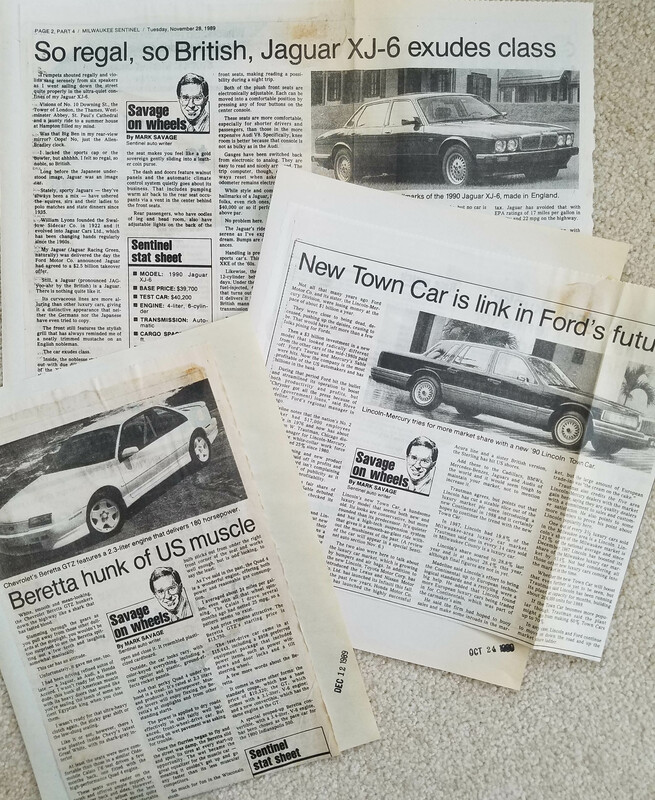 Since 1984 my byline has appeared in the Milwaukee Sentinel, and later the Journal Sentinel, first on feature stories, then business stories and since at least 1989 on a car review column, Savage on wheels. On Jan. 21 my last column appeared in the Sunday Cars section. We had a lot of fun in those early Sentinel years. Just for grins I tested a military version of the Hummer during the Gulf War, drove the Oscar Meyer Weinermobile, tested a watercraft on Lac La Belle, a Duck at the Wisconsin Dells, and drove a one-horse open sleigh at Old World Wisconsin. I even got to fulfill a childhood dream by taking a 3-day Skip Barber racing class at Road America, and while the Andretti clan didn’t have anything to worry about, I had a blast, and got faster each day. By my estimate I’ve driven more than 1,500 cars and trucks for my reviews, although never a Ferrari or Lamborghini. Yet I did get to drive a Rolls Royce, Aston Martin, Lotus, along with numerous Jaguars, Audis, Mercedes, Lexus, and Jeeps, even off road. Heck, some brands I tested in that stretch are long gone — Plymouth, Pontiac, Oldsmobile, Saturn, Scion, Suzuki. Looks like brands starting with P and S are doomed! Don’t ask which car was my favorite, I can’t pick just one. I left the paper 18+ years ago for a magazine career at Kalmbach Media and there was no reason the Journal Sentinel had to let me keep writing the column. But the editors did, and I’m eternally grateful. So this is just an online thank you note to everyone who has supported me at the newspaper, and all my faithful readers for 30+ years who have been critiquing (mentally and via email) my reviews, my annual Zoomie awards, and stories from the Detroit, Chicago and Milwaukee auto shows. It was a great ride. Thanks so much. But wait, there’s more … While bidding goodbye to my newspaper home of 35 years, this is not goodbye for Savage on wheels. There’s still my website, AND, some good news will be coming shortly from another trusted Milwaukee media outlet that plans to carry my weekly car and truck reviews. So stay tuned! Beauty should be more than skin deep when a car crosses the $100 grand threshold and beauty goes clear to the bone with the Lexus LC 500h. This is the hybrid version of the luxury car maker’s grand tourer (GT). Forgive me while I catch my breath. 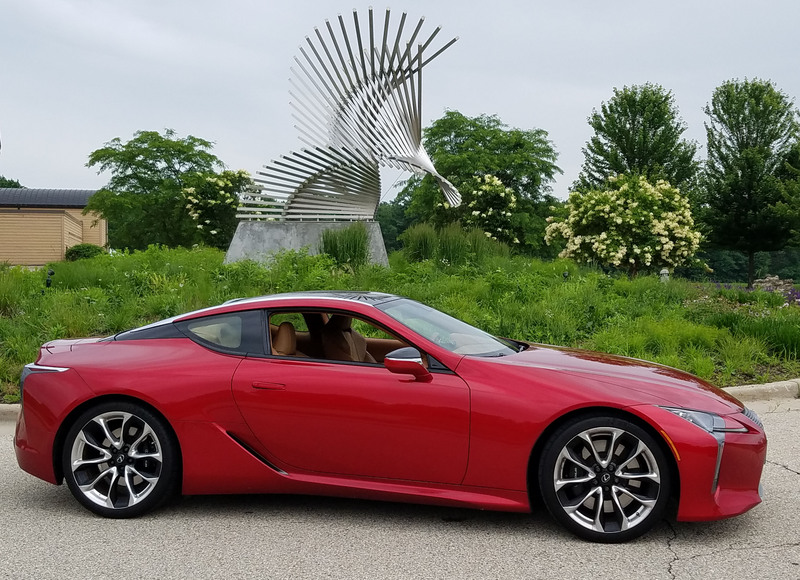 I just spent a week driving, and drooling over, the new Lexus halo car, the LC 500. If looks could kill, we’d all be dead. 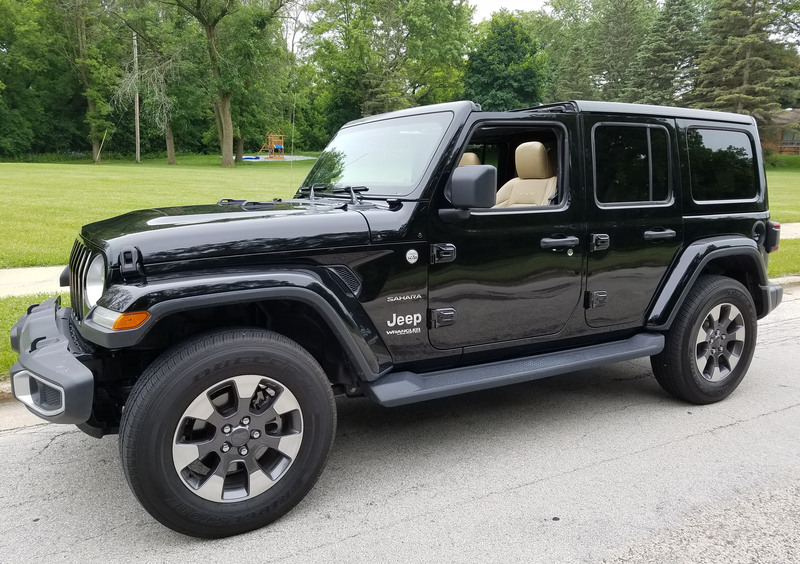 I’m not too proud to say that I used to dread test driving a Jeep, especially the Wranglers as they have traditionally been the most basic of vehicles meant for crushing rocks, splashing water and wallowing in mud. As members of the Midwest Automotive Media Association (MAMA) Mark and I make the trip to Road America where we get to drive new cars from the manufacturers. This year, we drove the Ford Focus ST, BMW M40i, Dodge Challenger Hellcat, and GT, Jeep Grand Cherokee SRT8, Lexus RC F, Alfa Romeo Giulia, and Chevy Bolt. What fun. Below are videos from some of the drives. Related: Read Mark’s full review on the Focus RS.